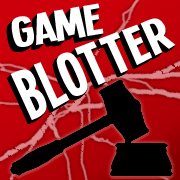 This category includes posts about games that don't fit into the other categories - such as about alternate reality games - as well as general game discussion and related news, such as TV shows and books. Lightsaber Academy, one of Hasbro’s offerings for Star Wars Triple Force Friday in October, allows kids to train as Jedi with their choice of master. A switch hidden in the hilt selects between several iconic characters, such as Yoda and Obi-Wan Kenobi, with matching changes to the toy’s color and audio instructions. The lightsaber’s audio and motion-sensor technology guides a user through a variety of training exercises and when connected by Bluetooth to a local mobile device can track and display performance. Progress also advances in a head-to-head game available when two lightsabers are connected. Information, though, is stored in the toy, so that a player’s ranking carries with them when they visit a friend’s house and connect to a different device. 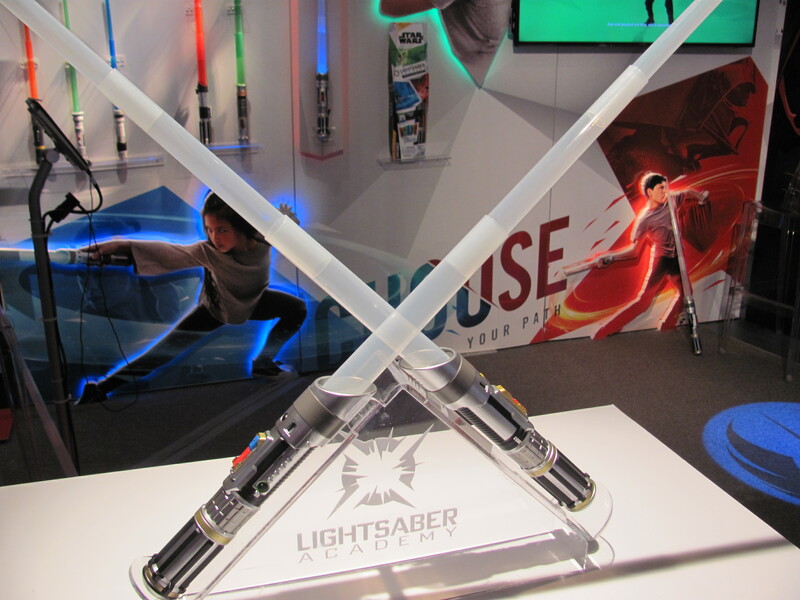 At release, a single lightsaber will retail for $50. How do you like your Pathfinder? 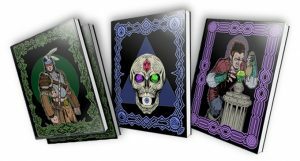 The Adventure Omnibus Kickstarter combines every single A, B, and C-series adventure released by Adventureaweek.com (AAW Games) from 2010-2018. And it’s quite extensive, which is to be expected for an eight year omnibus. A-Series dealswith the struggle of nature vs. civilization, with cause and effect as opposed to good and evil having a profound and lasting impact upon the world in which the players exist. The B-series has over 24 adventures designed for use in any campaign setting and a multitude of environments. And finally the C-series involves dungeons and exotic encounters with challenges which are more a battle of cunning and wits than might. You can find the path to adventure (see what i did there?) here. The thing I love about the next campaign is the warning to not use them as oven mitts. 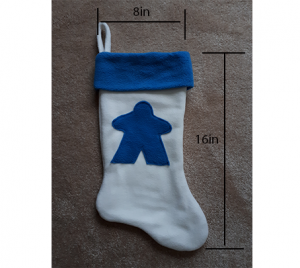 These meeple themed stocking have five days to go as of this post and are set for delivery this year! Do you have a gamer on your Christmas list? (my bad of course you do) You can spread some holiday cheer by chcking out the campaign here. Directed by George Romero, Night of the Living Dead is credited with spawning the zombie genre. CMON has also announced the opening of an office in Los Angeles. The new office, led by Geoff Skinner, will focus on relationships with television, film, and electronic game companies. For the 12th year the Chicago Toy and Game Show (ChiTag) is hosting the young inventor challenge. The Young Inventor Challenge provides an opportunity for children ages 6 to 18 to showcase their own original toy & game inventions to toy & game industry professionals, members of media and the general public and ignite their imagination, creativity and presentation skills. The judging is split into two categories, Junior (6-10) and Senior (11-18). There is a $15 requested donation to help cover administrative costs when you participate in the Young Inventor Challenge. Anyone can participate, and you do not need to attend ChiTag. Participants and their immediate families however are invited to be guests to the Fair with complimentary admission to ChiTAG for the whole weekend should they decide to come. 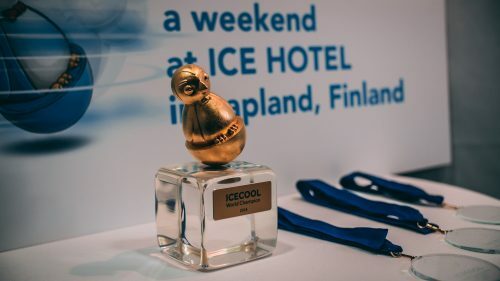 The Young Inventor Challenge can provide a means of taking the inventions to even greater heights, with professional critiques from industry experts and the opportunity to show their work off to the public, toy industry, and members of the press. Do you know someone who has been sitting on an idea and want to get it out there and show the world? This their chance. DEADLINE TO ENTER IS OCTOBER 31, 2018! ALL ENTRY MATERIALS MUST BE RECEIVED BY NOVEMBER 2, 2018! 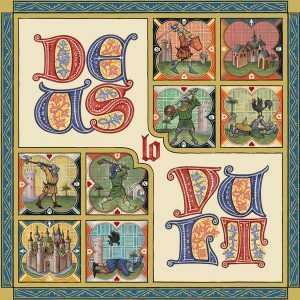 Deus lo Vult is a board game for two to four treacherous and greedy marauders and murderers. Based on opulent Euro pean manuscripts of the 12th to 15th centuries, the game draws heavily on the military games played by the medieval aristocracy all over the world: shogi, xiangqi, chaturanga, and backgammon. You control an army of crusaders trying to loot as much treasure from the Holy Land as possible. At the same time, you hinder the progress of other players using the mutually shared army of the Saracens. God is watching the Crusades closely and often intervenes with Divine Will events that you may use to your advantage. I give the designers a lot of credit. It is not easy to approach a game where religion is involved. Get invading while it’s hot, only three days to go on this one at the time of this post. You can find it here. Since I heart Japan, our next stop takes us to the RPG world of Oddity high. 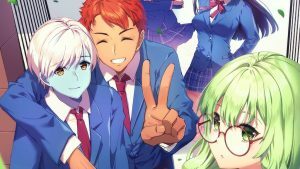 Oddity High is a tabletop RPG about the life of a Japanese high school student – one who’s also got one foot firmly in the bizarre. It’s influenced from the ground up by anime, manga, and video games that take the life of a high schooler and drive it off the deep end: Haruhi Suzumiya, the Persona games, Hatoful Boyfriend, and many more. You’re a high school student that’s probably nowhere close to being ordinary. 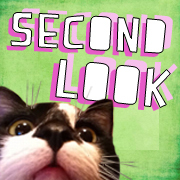 Whether you’re dealing with aliens, psychics, ghosts, demons, eldritch gods or sentient cats is up to you – but whatever it is, you’re in the thick of it. 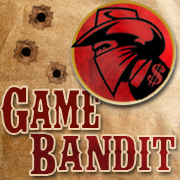 Fortunately, by happenstance or by design, you’ve got a gang of like-minded, equally-abnormal friends at your side – and with their help, you’ve got a fighting chance at surviving it. Just don’t forget that you’re also going to need to survive high school, as well. Oddity High is powered by the Apocalypse Engine, the system used by legendary and award-winning games such as Dungeon World, Monster of the Week, The Sprawl, Urban Shadows, Fellowship, and many, many more. It has 11 days to go and has already doubled its funding goal. If you back this project, just don’t pick vanilla. The final project this week could use a little love if it’s going to make it. Dreeples are dragon meeples, and I think they look great! 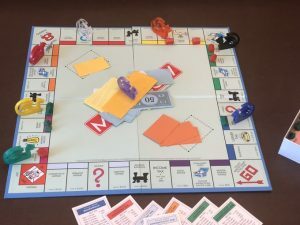 I think of the pictures shown their most practical use would be for Tsuro, but I do enjoy the picture of using them as replacements in monopoly. This campaign is also for an original a game called dreeple wars if your looking for a little more damage to inflict. The dragons are set to ship and burn villages near and far in December. 22 days to go in the current campaign. “Thomas, would you like to review Vampire: The Masquerade 5th Edition?” they asked. Would I? I mean, I’ve never played Vampire before. 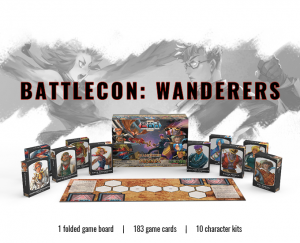 I’ve heard things about it, sure, but played this game that’s been around for over 25 years, a game that changed rpgs, bringing in a new wave of gamers to the hobby? I haven’t. Friends have played it. I’ve seen Kindred: the Embraced. I’ve attempted to play the Jyhad CCG. I’ve thumbed though a few titles in the line over the years such as Hunter: the Vigil, Changeling: the Lost, and Wraith: the Oblivion. I’ve heard of years and years of world building, metaplot, and lore so thick White Wolf killed the line at least once to make it easier for new players to join in. So yeah, let’s take this new edition from the position of a completely new player to the World of Darkness. I don’t have many assumptions about the setting or the game apart from you probably start a campaign with a scene as you, a mortal, before becoming a vampire; there are vampires from different bloodlines secretly running things; and there’s an official LARP that is simultaneously awesome and universally hated with a passion that burns like the sun. So. 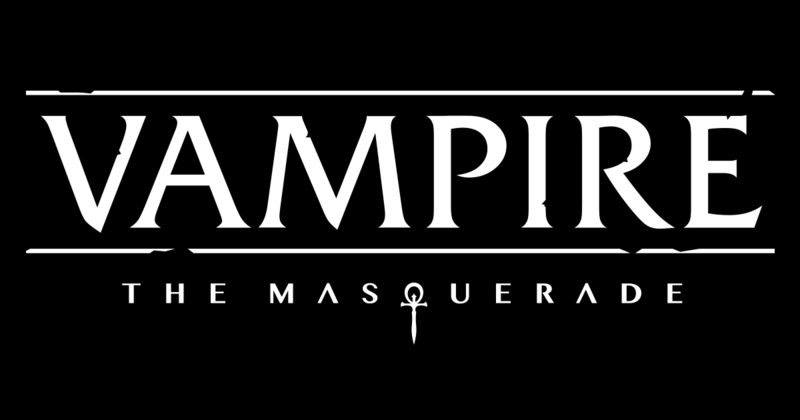 What does Vampire: The Masquerade 5th Edition (V5) look like to a first-time player? Thick. There book is 406 pages long. Do I have to read all of that to play? Open book, Thomas. Dive in. The art style of the book is centered around the use of digitally-manipulated photographs, which is… interesting. There are stock photo resources used here and original photographic assets, which is a technique I’ve seen (and used – I do layout and graphic design for other RPGs) in other horror role-playing games set in urban settings during contemporary times. (Chill and Unknown Armies are two I’ve worked on that use this technique, so to me, it doesn’t look like anything out of the ordinary.) The layout is easy to read with a two- or three-column layout per page with plenty of whitespace and room for the copy to breathe. It’s light and open and suddenly those 400+ pages don’t seem like much of a threat. We open with twenty-eight pages of in-world fiction presented as a collection of papers, screenshots on phones, and the like, collaged as if the reader is going through a stack of papers on someone’s desk. It’s very… clean? I recall in earlier editions of World of Darkness games, the front chapters were filled with hard-to-read in-world fiction, scribbles on notebook paper. 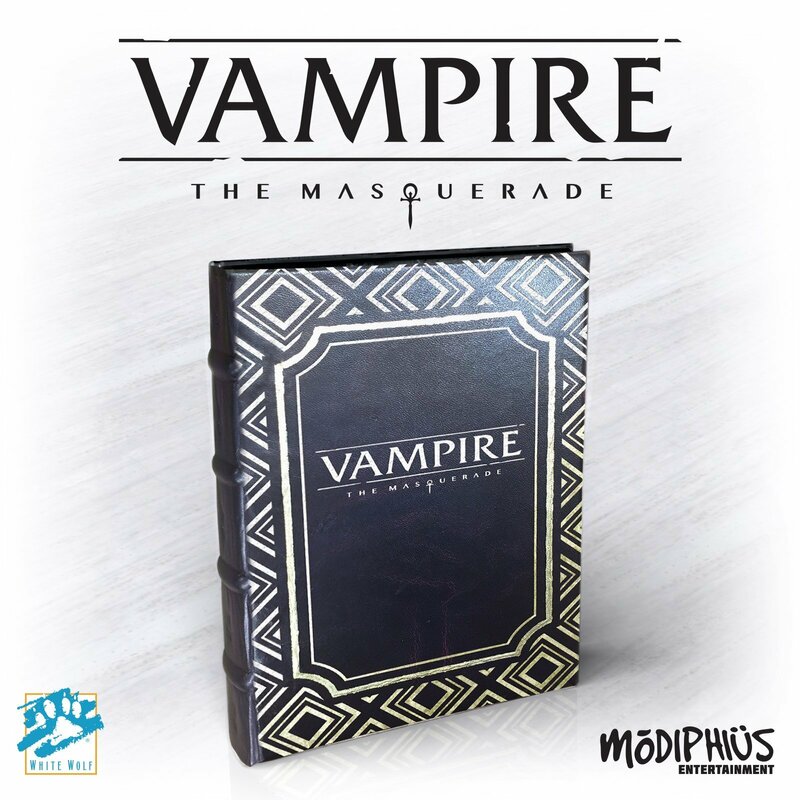 Here, this serves to be an introduction to what vampires are in the game, that there’s a “masquerade violation” that’s got to be dealt with violently, and what clans are. 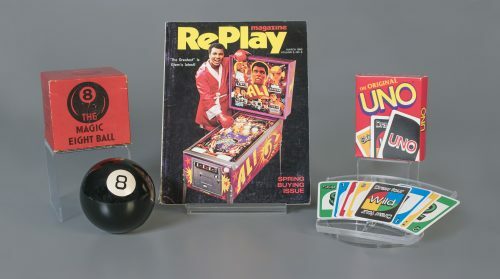 Oh, an early example of play before concepts are introduced. This is done rather well. It’s one of the best example of plays I’ve seen. 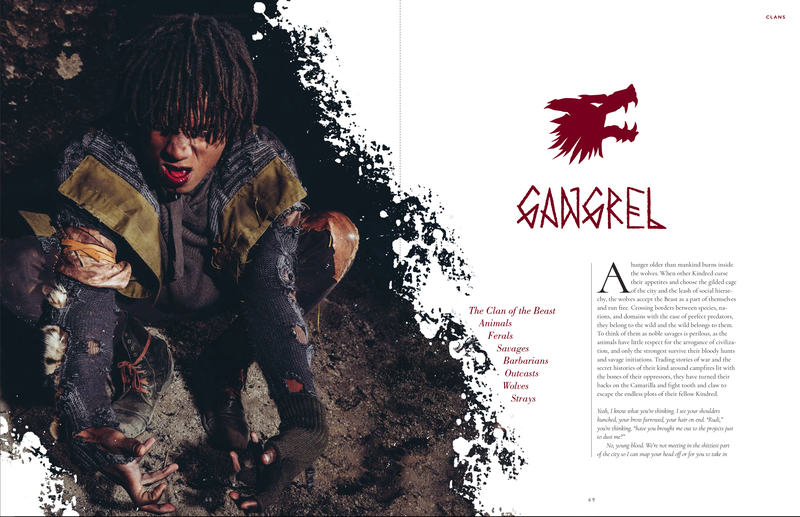 A concept is introduced with a page reference to later in the book. 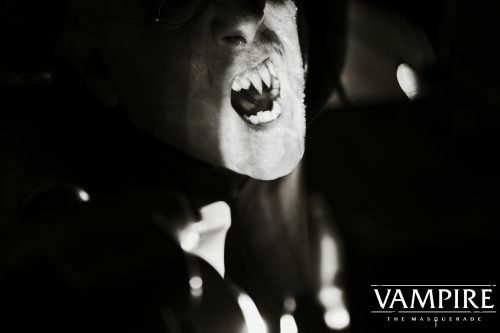 We’re not just reading from a script like so many other games’ examples of play – we have a bit with dialogue, a summary of what’s going on, some decision points our game’s Storyteller is doing, a look at some of the mechanics, and a definite feel of how the game designers believe Vampire is to be run. Here’s a thing: players are adding world-building elements. Onward: lots of quick overviews of clans and larger groups/movements. Rules seem simple: stat + skill to get a dice pool of ten-sided dice, 6s or higher are successes. Pairs of 10s are even bigger successes: 10s alone aren’t awesome, buckets of them are. You’re rolling against a target number; if you fail you don’t do the thing unless you want to, as long as something bad happens. Perhaps you took damage. Perhaps you were caught on a CCTV camera. Perhaps you didn’t notice you dropped your cellphone right there. One third of the way through and it doesn’t feel like the size of the book is imposing. Continue through character creation and we see we’re using relationship maps, so yes, more emphasis on all the players helping to create the world you’re playing in. You should create your characters together, because that’s group play. First, create yourself as a human. That sentence is written in red with a lot of space above it and a lot of space below it. Yes, the game earlier did state that you’re not playing good guys in this game, but here, some monster kills you and now you’re going to play a monster. Halfway through the book and we’re looking at life as a vampire and all the horrible things you must deal with: hunger, power, and your own humanity. A slew of optional rules come in (just in case you do want a blow-by-blow health attrition fight), and then we’re at Cities. Here’s how cities work. Here’s how domains work. Here’s several hunting grounds you might find. 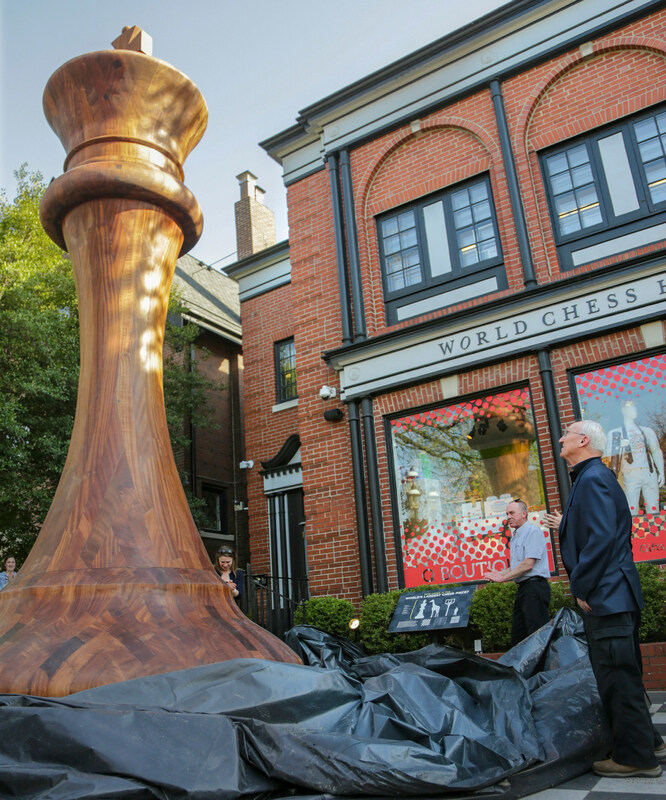 Here’s how to make your city into a city run by vampires. We’re very close to the end of the book. There’s a whole section of Storyteller advice on how to run a game of Vampire. There’s a sample chronicle (campaign setting/storyline). A packet of opponents that might be thrown against your coterie of vampires. And we’re out. All that lore, all that heavy weight of the past twenty-seven years of canon and metaplot? It’s not here. Just the basics of being vampires. Not a whiff of Werewolves, Hunters, Changelings, Mages, Mummys, or Wraiths. It feels like I, someone who knows nothing about the history of this game, could jump in and start playing a game where we’re all vampires. So. For a gamer who hasn’t played Vampire, this looks… rather easy to get into. 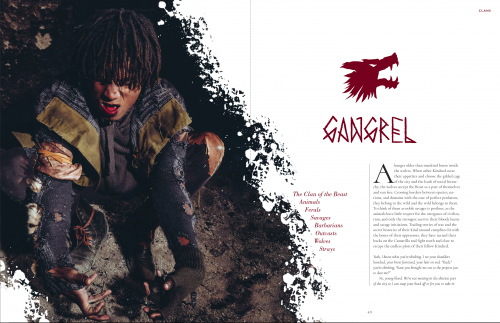 A pre-release pdf copy of Vampire: The Masquerade 5th Edition was provided free for review by White Wolf. Puzzling Pixel Games have currently funded for their debut game The Abandons. 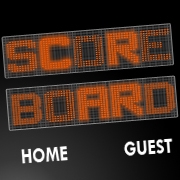 Created by Michael Blascoe this solo game centers around a voice inside your head, calling you to go, to the abandons. 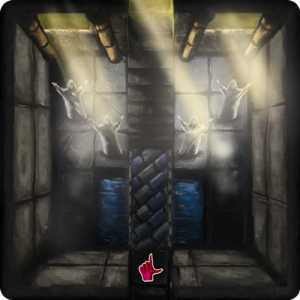 In The Abandons, you start at the entrance to the abandoned, yet living labyrinth and hope to make it to the final card, the exit, by drawing a card each turn and navigating your way to the end, the exit. Along the way, you may encounter surprises or items to help you. What will you find there? Will you find peace and silence the voices inside your head? or will you spend your last days trapped? The game is $13 and is scheduled to ship May 2018. Soloists can check it out here. Next up, as if it was raised from the bottom of the murky water from years of slumber is a reprint of Dragon Dice – Swamp Stalkers. 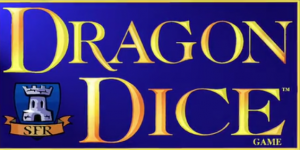 Dragon Dice is a collectible dice game for 2 or more players. Originally made famous in 1995 by TSR, Dragon Dice has continued to expand and evolve under the reign of SFR inc. Players use colorful dice to represent armies of different fantasy races which battle to control essential terrain in this fast-rolling game. The first player to capture two terrains immediately wins the game. A total of 40 dice, two playmats and a copy of the 2-player starter set is $35. So begin your adventure. Shipping is scheduled for August 2019. For the wargamer, I wanted to showcase this game I ran across. 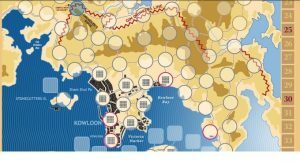 Glory Recalled: Hong Kong 1941 is a board wargame based on the Battle of Hong Kong in December 1941. This is a unique choice for a military game for sure. Created by David Cheng. In his Kickstarter bio, David says “we can do something to recall people’s attention to this precious history and commemorate the forgotten heroes who sacrificed their lives for Hong Kong.” The game uses a semi card-driven system. Players take turns to play cards from their hands to activate a formation of units on the map. Cards may also be used to provide combat support like artillery and air support or for rallying disrupted units. There are also historical and what-if event cards which add replay value to the game. 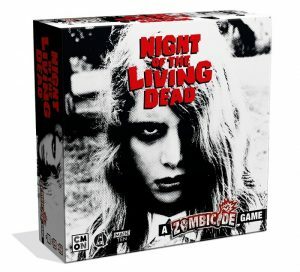 The game will run you approximately $41 The campaign ends August 14th with a shipping date of December 2018. Your defense starts here. 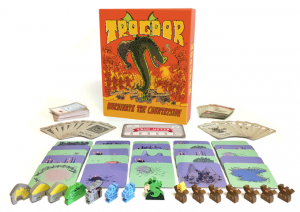 And last but not least, it’s Trogdor!! The Board Game. Now full disclosure I am a massive fan of Homestar Runner, the online webcomic the character Trogdor comes from. To give you a little history, Trogdor was a man, he was a, a dragon man! For centuries, the legendary wingaling dragon Trogdor the Burninator has terrorized the peasant kingdom of Peasantry with his scorching flames and greased-up beefy arm. Now, he has descended from the mountains once again and will not stop until he burninates the entire countryside and all those unfortunate enough to get in his way! Your goal is to burn everything in Trogdors path. Some people shockingly are not good with this in the village and will be trying to stop you (BOOOO!) This co-op game is very true to the spirit of the character and has rocketed past it’s stretch goal of $75,000 (at the time of this article it has raised 10 times that amount). 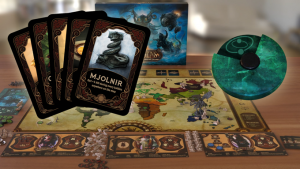 $40 gets you the version with wooden minis and $60 gets you the wooden mins + plastic minis. What are you waiting for? get Burninating!